I'm so sorry to announce that the October Scanfest will have to be cancelled. My adult daughter is moving into an apartment this weekend after living with me for the past six months. She will need my assistance in getting the last of her things moved next Sunday. After I am sure of my Thanksgiving plans, I will announce the next Scanfest. It will tentatively be on November 18th. "SAMUEL A. SNOOK, proprietor of a well-known hardware store in Johnstown, Cambria county, Pennsylvania, is a representative of one of the old pioneer families of this country, being of the eighth [sic - sixth or seventh] generation of the Snook family in America. 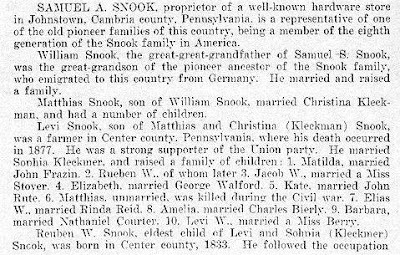 "William Snook, the great-great-grandfather of Samuel S. [sic] Snook, was the great-grandson [sic - son or grandson] of the pioneer ancestor of the Snook family, who emigated to this country from Germany. He married and raised a family. "Matthias Snook, son of William Snook, married Christina Kleckman [sic - Maria Christina Kleckner], and had a number of children. "Levi Snook, son of Matthias and Christina (Kleckman [sic]) Snook, was a farmer in Center [sic - Centre] county, Pennsylvania, where his death occurred in 1877 [sic - 1889]. He was a strong supporter of the Union party. He married Sophia Kleckmer [sic - Margaretha Wolfart(h)], and raised a family of children: 1. Matilda, married John Frazin. 2. Rueben [sic] W., of whom later 3. Jacob W., married a Miss Stover. 4. Elizabeth, married George Walford. 5. Kate, married John Rute. 6. Matthias, unmarried, was killed during the Civil war. 7. Elias W., married Rinda Reid, 8. Amelia, married Charles Bierly. 9. Barbara, married Nathaniel Courier. 10. Levi W., married a Miss Berry. 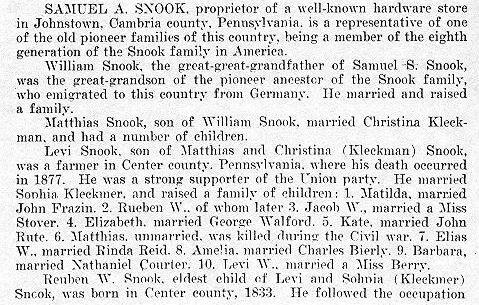 "Samuel A. Snooks [sic], first son and eldest child of Reuben W. and Mary (Walker) Snook, was born in Myles [sic] township, Center [sic] county, Pennyslvania, May 23, 1859. He was educated in the public schools of Bellefonte, where he was apt and studious. He then served a three years' apprenticeship to the wire drawing trade, and then held a positon of clerk in the Cambria County Bank of Johnstown; was with Bantly Fronheiser for three years, and then in the hardware business with John Dibert until 1889, when the flood of May 31, of that year, destroyed the building. Mr. Snook established a hardware store at No. 514 Main street, in 1899, and has conducted this very successfully up to the present time (1906). He is highly respected and esteemed by a large circle of friends and business acquaintances. He is a member and trustee of the United Brethern church, and a stanch supporter of the Republican party. He is a member of Johnstown Council, No. 401, Royal Arcanum. 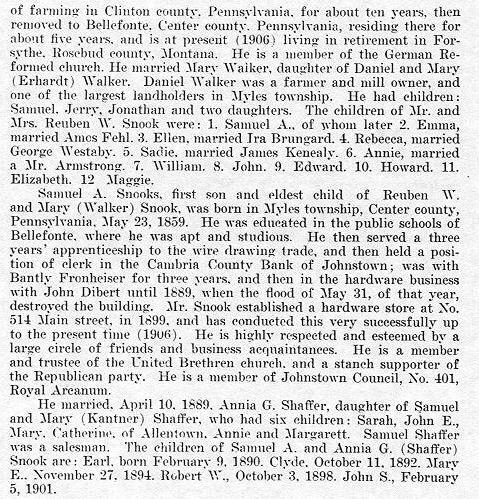 "He married, April 10, 1889, Annia G. Shaffer, daughter of Samuel and Mary (Kantner) Shaffer, who had six children: Sarah, John E., Mary, Catherine, of Allentown, Annie and Margarett. Samuel Shaffer was a salesman. The children of Samuel A. and Annia G. (Shaffer) Snook are: Earl, born February 9, 1890. Clyde, October 11, 1892. Mary E., November 27, 1894. Robert W., October 3, 1898. John S., February 5, 1901." Samuel Austin SNOOK was the brother of my children's 3rd-great-grandmother, Rebecca Catherine (SNOOK) WESTABY. There is a great deal of genealogy in this biography, some of it correct, some of it definitely not so. While transcribing this biography, not only did the genealogical errors make me cringe, but so did the obvious and numerous spelling and punctuation errors. Of great interest to me, however, is the note that Samuel's business was destroyed by the Johnstown Flood of 1889. This was one of the worst disasters in history of the United States in which 2,209 people were killed from the South Fork Dam on the Little Conemaugh River bursting, causing 20 million tons of Lake Conemaugh to cascade down the river. It damaged or destroyed five towns, killed 99 complete families, and caused $17 million dollars (the equivalent of over $407 million dollars today) of damage. To date, only the Galveston Hurricane of 1901 and the attacks of 9/11 in 2001 produced more casualties. Several movies and numerous books, including one written by Pulitzer Prize-winning author David McCullough, have featured this disaster. 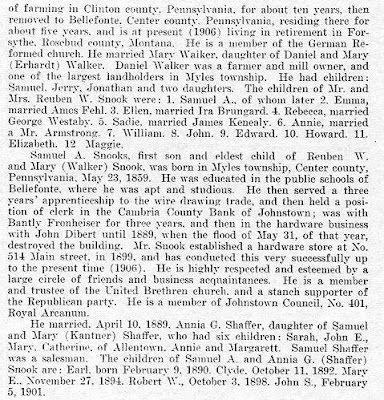 This biographical sketch was taken from Volume III of the History of Cambria County, Pennsylvania with Genealogical Memoirs, by Henry Wilson Storey, published by The Lewis Publishing Company of New York and Chicago, 1907. Samuel's sketch was found on pages 626 and 627. This county history, transcribed and with images, can be found at the Cambria County, Pennsylvania GenWeb site.